Emilia Romagna is a region of Italy that stands out for its quality of life and beautiful cities. This northern region is one of the wealthiest in Italy and is widely considered to have a great lifestyle, great transportation connections, and a rich array of cultural pursuits. Covering a wide expanse from Piacenza, just 67 miles from Milan, all the way to the Adriatic Sea, it takes in fertile plains along the Po River valley, verdant hills, lofty peaks, and sandy beaches. The region is divided into nine provinces: Bologna, Modena, Parma, Piacenza, Reggio Emilia, Forli-Cesena, Ferrara, Ravena, and Rimini. Its primary cities are located along the ancient Via Emilia, in the flat Po Valley. There are vibrant cities and tranquil towns where time stands still. The region also has high-tech industry and centuries’ old crafts traditions. The contrasts meld merrily: rustic villages and cultured art cities; prestigious universities and homey country festivals. The plains give way to rolling hills, high mountains and thick woods of the Apennine range. Emilia Romagna has a formidable food heritage such as parmigiano cheese, prosciutto di Parma (cured ham), mortadella, balsamic vinegar, and more. Miles of vineyards, fruit orchards and other agriculture supply not just the area’s restaurants but large commercial food processors, too, so that the region is called the nation’s bread basket and fruit bowl. An excellent rail service between cities makes it easy to get around the region, and beyond. With airports in Bologna and Rimini, all of Europe is in reach. This is a region that won’t leave you bored. There is much to see and do, and you’ll have all of Italy’s best qualities in one place. It’s hard to encapsulate a region this large; it has just about everything—alluring hill towns, an array of art cities, mountain villages, and seaside resorts. The largest city, and regional capital is Bologna. Home to Europe’s oldest university, it gets the most attention as a destination, and is both hip and historic. But don’t overlook elegant Parma, stylish Modena, or ravishing Ravenna; Faenza, Imola, Ferrara, and dozens of other attractive towns all offering a high quality of life. Many of the cities are flat and walkable and bicycles are the favored mode of transportation. But don’t despair if it’s a hill town that you’re after; there are plenty of those, too. There are regional parks and national parks as well as nature reserves for outdoors enthusiasts to indulge in hiking, mountain biking, horse riding, and climbing. With more than 55 miles of coastline, there is a selection of wide sandy beaches to choose from. Rimini is most famous for its nightlife, but many resorts offer a variety of services, beach parties, or quieter corners to relax. The climate varies by location, from snow in the mountains to milder in the hills to damper and foggy in the plains during the winter months. Summers tend to be hot and humid, though the mountain areas remain cooler, the hills and sea enjoy breezes. The region has dozens of private and public hospitals and health clinics, offering excellent access to medical care. Dante wrote Paradiso here. Fellini was inspired (and buried) here. Pavarotti was born and trained here. Verdi composed some of the world’s most famous operas here. Influential food authors Marcella Hazan and Pellegrino Artusi were from here. There’s no denying—there are loads of cultural and culinary attractions in Emilia Romagna. This is a region widely acknowledged to offer a high quality of life; cities like Parma and Ravenna are consistently in the top 20 in national rankings of most livable cities. From Renaissance masters to a contemporary art scene; from eye-popping Byzantine mosaics to theatrical excellence, there is much to enjoy. Faenza is known as a cradle of ceramics-making, still training ceramicists from around the world. But this is also home to Ferrari, Lamborghini and Maserati, so life doesn’t have to be slow if you don’t want it to be. There are also surprises to be discovered everywhere, from glorious castles scattered around the countryside, to canal towns on the coast that are like mini versions of Venice. Art-filled churches and interesting museums occupy nearly every town, and there are 25 golf clubs for those who like to hit the links. There are opera houses, theaters, and events all year round. Food lovers will adore Emilia Romagna, considered the country’s culinary capital, with good reason. 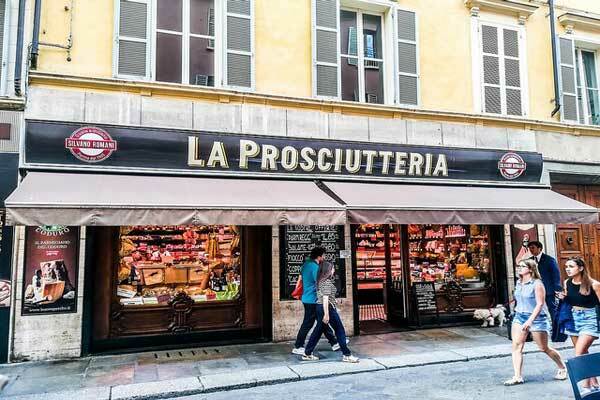 This is the epicenter of gastronomic delights—pillowy filled pastas, superb salami, effervescent wines, and those famous Parma products (prosciutto and parmesan); plus Modena’s balsamic vinegar, Bologna’s meat sauce, and excellent seafood along the shore. This is a region that loves its aperitivo tradition, serving a wine or cocktail concoction with a plate of nibbles for a pre-dinner outing. With universities in Bologna, Parma, Reggio Emilia, and Ferrara, there is a youthful vibe that infuses the cities, providing nightlife as well as cultural offerings. Smaller towns exude a slower pace with beautiful ambiance but in reach of cities. All of northern Italy is easily accessible from here, including Venice, Verona, Padova, Milan and Lake Garda, as well as Florence. The southern part of the region touches San Marino, the world’s oldest republic, as well as Le Marche. Prices here aren’t cheap but they’re not unreasonable, either. Like anywhere, the primary cities will carry higher price tags, while smaller towns are more affordable. Go towards the mountains and real estate costs drop even more. Longiano, quaint castle town in Forli-Cesena province: two-bedroom, two-bathroom independent house of 1,184 square feet: $98,144. Rocca San Casiano, a pretty mountain town south of Forli: two bedrooms on two levels comprising 1,400 square feet in town next to the main piazza: $77,715. Brisighella, charming village in the hills just a few minutes south of Faenza: two-story stone house of 1,400 square feet with two bedrooms and two bathrooms: 85,715. Parma, cultured art city with parks and museums: Three bedrooms on two levels in the historic center with 1,023 square feet: $181,714. Langhirano, a country hill town south of Parma amidst historic castles: Three-bedroom, two-bathroom restored stone house in the hills with garden: $142,859. Ravenna, glittery historic city of art and culture near the Adriatic Sea: spacious three-bedroom apartment with 1,270 square feet with two balconies in the city center: $164,574. Forlimpopoli, a pretty culinary town with castle near Forli’: a two-bedroom apartment in the main piazza with 1,206 square feet: $170,288. Modena, bustling beautiful and vibrant city in the region’s center: A city apartment with 1,119 square feet, three bedrooms and one bathroom: $194,289. Bologna, renowned for its university and arcade-studded centro storico: One-bedroom, one-bathroom apartment of 527 square feet in the city center with a balcony: $213,718. Also in Bologna’s center an apartment of 1,184 square feet with three bedrooms and one bathroom: $302,862. 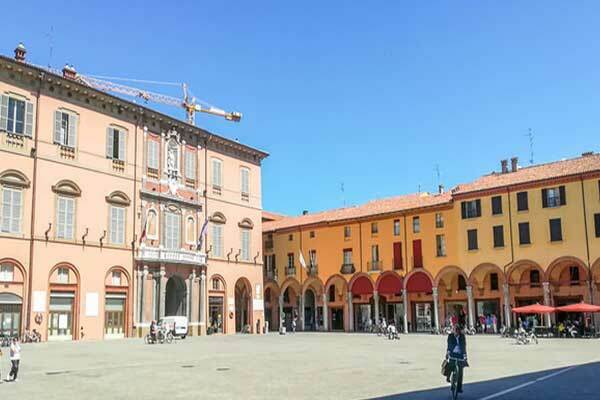 Faenza, lovely and lively town famous for its ceramics artisans: Two-bedroom, two-bathroom apartment in the city center of 969 square feet: $142,859; a country house of 1,224 square feet with three bedrooms and two bathrooms, a garden, and view over the fields: $205,718. Furnished rentals in most towns can be found from $629 a month. In the cities, expect to pay more. Listings in Ravenna show an average of about $915 a month, while in Modena expect to pay between $857 to $1,600 in the center. Parma has nice rentals in the center for $857. Bologna is the region’s costliest city, with rentals in the center ranging from $1,143 to $1,486 a month. Aside from real estate prices, the overall cost of living is on a par with the rest of the country. 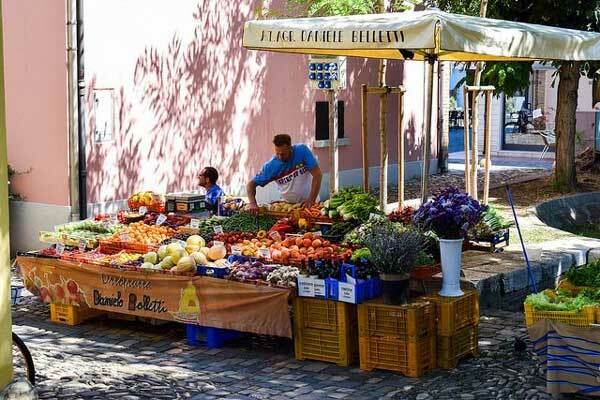 Emphasis is placed on eating well, and here where many of the specialty foods are produced, you can find even lower prices by buying from the source. You’ll find a range of restaurants from pizzerias, traditional trattorias, and upscale trendy places. In fact, the restaurant named “best in the world” is in Modena (prices start at $68 for a plate of pasta.) A full lunch with glass of wine at a trattoria costs around $16, Pizza and beer for two is just $22.85. Parmigiano cheese, aged 18 months is $6.23 a pound.